One of the greatest benefits of homesteading is the increased responsibility you have over your life. You choose what to eat, how to earn money, how to educate your children, and how to prevent and treat illnesses. Taking responsibility for our personal health is often frightening. It is easy to worry about doing something wrong and alternative healthcare is viewed by society as ineffective, or worse, dangerous. All medicines are derived from plant material. You can start small, adding more herbal health care as your knowledge increases. There are countless resources you can turn to for guidance. In order to feel comfortable using herbs for medicinal purposes, you need to understand there are thirteen different classifications of herbs. Although there can be overlap, each category of herbs does something specific for the body. Astringents are the first category. These are drying and drawing herbs. They can be used internally to tone mucous membranes and treat conditions of excess, such as diarrhea. They can also be used externally to tone the skin or to pull out splinters and stingers. Aromatics are the second category of herbs. These herbs have volatile essential oils and therefore, have strong aromas. Aromatics are generally used to support the digestive system, disinfect the respiratory tract or help expectorate the lungs. Alternatives, the third category of herbs, are the herbs you should use when you are feeling sick and want to support your body’s natural defenses. Adaptogens are the fourth category of herbs. These herbs help your body handle stress, restore overall emotional balance and strengthen your body’s functioning as a whole. Bitters are the fifth category of herbs. They are used to stimulate the appetite and aid digestion by encouraging the production of gastric juices. Nervines are the sixth category. Nervines support and calm the nervous system. They are an effective treatment for muscle tension, circular thoughts, and anxiety. The seventh category of herbs is carminatives. These herbs help to expel gas from the digestive system. Demulcents are the eighth category. Demulcents are herbs that produce a slime that coats and soothes mucous membranes and treats dry conditions. These herbs are best extracted as an infusion in water. Next are diaphoretics. The ninth category of herbs is taken in order to raise body temperature, making you sweat and increasing circulation. Diuretics are the tenth category of medicinal herbs. Diuretics help increase urination. Emollients are the eleventh category of herbs. They are similar to demulcents, but they are used topically to prevent or treat skin conditions. Expectorants are herbs that break up mucus in the lungs and expel it more effectively. The final category of herbs is called tonics. Tonics can be safely taken on a regular basis to support overall health. Now that you know the thirteen categories of medicinal herbs, you need to know some of the different preparation methods, but first, a note on dosages. Herbal remedy preparations will have a recommended dosage. I find it best to take the minimalist approach, starting with the smallest recommended amount and increasing if necessary. When it comes to herbal care for children, I follow Clark’s Rule. This rule instructs us to take the child’s weight in pounds, divide by 150, and multiply that number by the smallest recommended adult dose. The foundation of all herbal preparations are herbal extracts. This simply means you are extracting the medicinal components of the herb from the less helpful plant materials. Extracts can be made as a liquid or a powder, but liquid extracts are less processed and thus more effective. The first type of herbal extract is tea. Teas are extracts that are made by using water as the solvent. There are four types of tea extracts: sipping teas, infusions, decoctions, and brews. You are almost certainly already familiar with the sipping tea. These teas are light in color and flavor. They are made by pouring boiling water over 1-3 teaspoons of dried herbs, covering and let steep for up to five minutes. Strain out the herbs, sweeten with honey. Herbal teas can be consumed regularly. 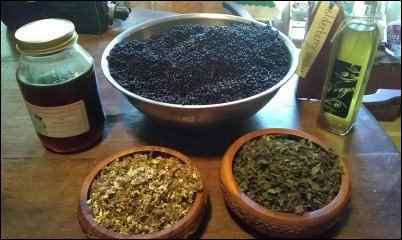 The second and third types of tea extracts are infusions and decoctions. These will be darker in color and stronger in flavor than sipping teas. Infusions are made with the more delicate plant parts, such as the leaves and flowers. Decoctions are made from the hardy plant material, such as roots, bark, and hard seeds. 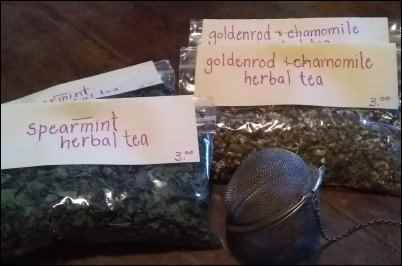 Infusions and decoctions usually call for ¼ cup of the dried herb to 4 cups of water. To make an infusion, pack the plant material in a glass jar and cover with boiling water. Allow to steep for up to 30 minutes. To make a decoction, place plant material in cold water and bring to a boil. Simmer from 20 minutes to an hour, depending on the potency you want. The final type of tea extract is a brew, which is a fermented infusion or decoction. 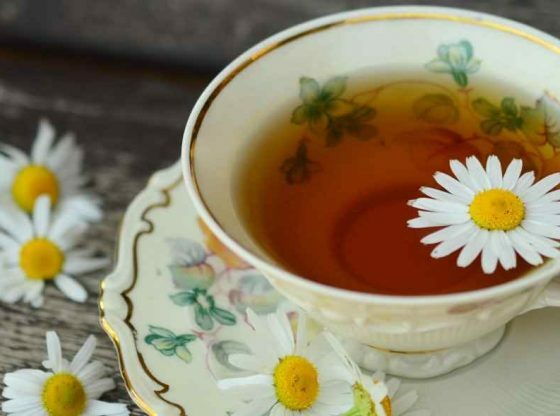 In addition to using the various tea preparations internally, you can also use infusions and decoctions externally in herbal washes and compresses. Using herbal tea extracts externally allows the medicinal components of the herbs absorb directly into the skin. Herbal washes are used in baths, for sinus rinses, facial steams and as mouthwashes. Simply make a strong infusion or decoction using the herbs of your choosing. Once you strain out the plant material, use the liquid in your herbal treatment. For an entire body soak, add the liquid to your bath water. If you are wanting a facial steam, bring the liquid to a simmer and stand over the steaming pan of herbal extract with a towel draped over your head and shoulders. If you want to use an infusion as a sinus rinse, add a small amount of sea salt and use in a neti pot according to manufacturer’s instructions. A compress is another treatment option using infusions and decoctions externally. Compresses are best for conditions that require several treatments a day for short periods of time, such as pink eye or tense muscles. Begin with a very strong infusion or decoction. Soak a cloth in the hot liquid. Squeeze out excess liquid and apply to affected area. The compress should be very warm, but not too hot – you don’t want to cause a burn! The second way to make an herbal extract is called a tincture. A tincture is a heavily concentrated herbal extract made with alcohol, vegetable-based glycerin, or vinegar as the solvent. To make a basic tincture, fill a glass jar ½ full of dried herbs and cover with the solvent of your choice. Seal tightly and allow to macerate for four weeks. Strain, bottle, and label. 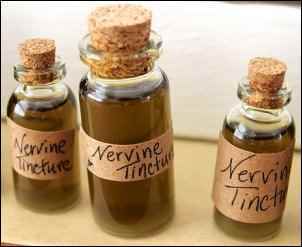 Tincture dosing is generally ½ teaspoon up to three times a day. You can turn your tincture into an elixir by adding honey to the finished product at a ratio of 2:1 (tincture:honey). Oxymels are an old-fashioned type of tincture that is enjoying a comeback. You can use oxymels for short-term conditions, or for daily use as a preventative measure, depending on the herbs you choose. To make an oxymel, fill a glass jar ½ full of dried herbs. Combine honey and apple cider vinegar in equal proportions and pour over the herbs, leaving a 1” headspace. Cap tightly with a plastic lid. Store in a cool, dark place for 6-8 weeks, shaking daily. Strain out the herbs and pour the liquid into sterilized glass bottles. This will last up to a year. The common dosage for oxymels is 1 teaspoon to 1 Tablespoon up to three times a day. Syrup is another preparation technique that is simple to prepare, very effective and easy to administer to young children because of the delicious taste. For a shelf-stable syrup, use one part tea to one part honey. If that seems too sweet, you can reduce the amount of honey, but you will need to make the syrup in small batches and store the syrup in the refrigerator. As this is not a daily drink, but used during times of illness, I opt for the shelf-stable, good-tasting medicine and use the recommended amount of honey. Elderberry syrup is one of the best treatments for sore throats and coughs. To make it, combine 2 cups of elderberries with four cups of water, 1 cinnamon stick and 1 teaspoon of grated ginger root. Bring mixture to a boil. Reduce the heat and simmer for 40 minutes. Remove from heat and mash the berries in the liquid. Strain through a cheesecloth, squeezing out all of the juice. Measure the liquid. Add an equal amount of honey. Gently heat until well combined, being careful not to bring it to a boil. Bottle in sterilized jars. Herbal extracts are also the basis for external herbal treatments. Liniments, ointments, and salves all begin with an herbal extract. Topical herbal remedies are very effective and gentle enough to use daily. As with internal herbal preparations, choose the herbs you will use in your product based on the specific need you are addressing. If you want to make a creamy lotion, make an ointment. Ointments are made by combining an herbal infusion with almond, olive, or coconut oil at a ratio of 1:4. This cream is extremely moisturizing and absorbs into your skin easily. Salves are not immediately absorbed into the skin – they work more like petroleum jelly. But, for painfully dry, cracked skin, salves can’t be beat. To make a salve, combine one cup of oil with 1-2 ounces of beeswax in the top of a double boiler. Warm gently until the beeswax is completely melted into the oil. Quickly pour into glass jars or tins. If you keep this in a cool area, it will last up to a year. Homesteading is a lot of work, but adding herbs to your daily life doesn’t have to be. As with any other homestead project, start small, learn as you go and trust yourself!